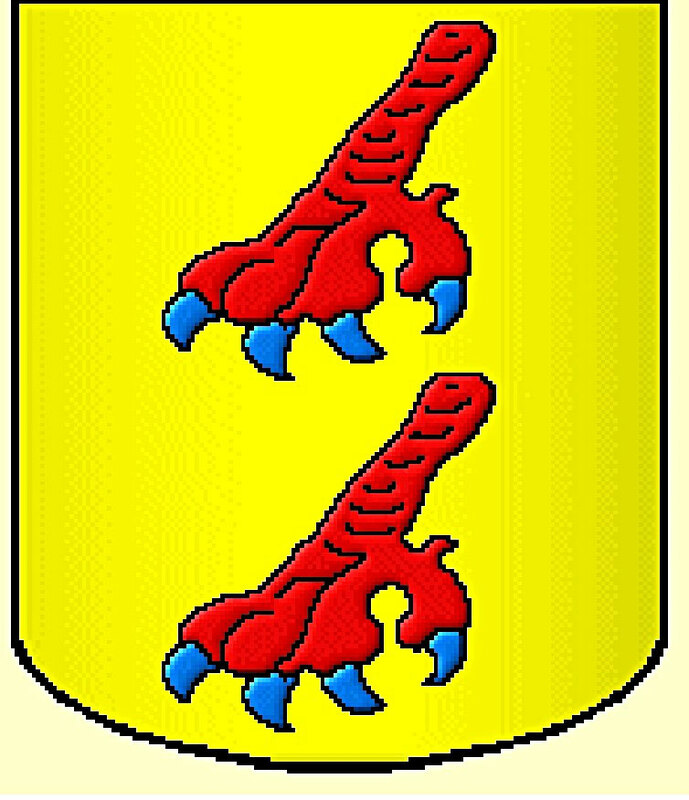 On the borders of the Charente, Charente-Maritime and Deux-Sèvres, halfway between Niort and Angoulême, on the territory of the town of Paizay-Naudouin, next to the village of Paizay-Naudouin, stands since the XIVth century, Chateau of Saveilles, combining the characteristics of a castle and a palace. 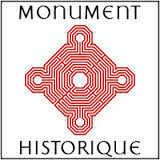 Classified (built and undeveloped parts) in the Supplementary Inventory of Historic Monuments (ISMH), by prefectural decree dated November 8, 2005, and repealing a previous decree of August 7, 1967, it is a square set, isolated from the mainland by wide moats filled with water and supported by walls. It is reached by two fixed stone bridges, which since the Revolution have replaced the bascule drawbridge south and the swing bridge with two arches north, formerly defending access to the castle. To the east and south, two buildings placed at right angles, are extended at each end by a large defense tower: the tower of the prison, with its gunboats to the north, the great tower with its loopholes, loopholes battlements to the south. The other two sides, north and west, of the square delimit a courtyard in the middle of which stands a large well. The front courtyard has a long outbuilding with corner towers. There the fourteenth, sixteenth and nineteenth centuries live in harmony, under the Charente sun. Despite the ravages of the French Revolution and time, a multitude of sculptures and dormers adorned with mythological subjects, loopholes and arrow slits, battlements and a nineteenth century chapel remain. 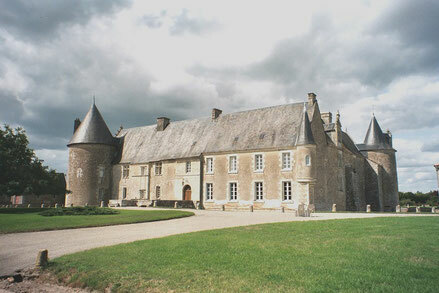 Of this Renaissance chateau, we admire today, the remaining four dormers on the ten that originally lit the attic of the castle, decorated with mythological subjects, both small mullioned windows, carved, to the left of the front door, the carved chimney stack which dominates the roof of the main building to the east, the Hercules statuette holding his club at the north gable and the carved top of a window that lit the hall of justice above the entrance pavilion now defunct, and overcomes the gate of the garden. 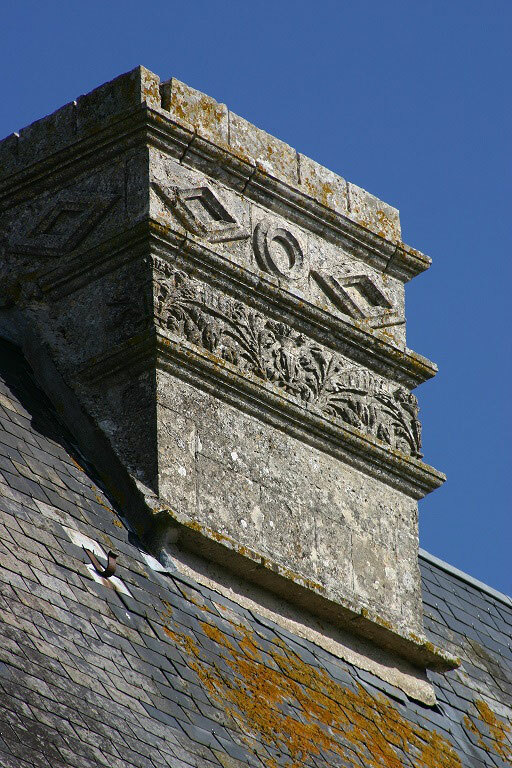 A carved stone, finely decorated with "putti" was embedded in the wall of the chapel built in the nineteenth century, with in its center René de La Rochefaton's terraced arms, whose ancestors are the builders of the castle and his wife Sébastienne Taveau whose marriage took place before 1519. Since the twelfth century, and the erection of the castle by Thibault de La Rochefaton in the late fifteenth century , the masters of the place have succeeded until today, by way of family inheritance. The first, the Barrier and Montalembert possessed the land, land that fell within the Marquisate of Ruffec. 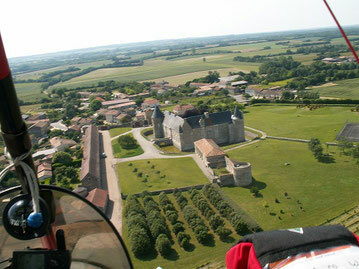 In the early sixteenth century, their descendents, La Rochefaton, built the castle as we know it. Among the masters of this noble house, there are the marshals de Caumont La Force, then de Turenne, at the time when the R.P.R. 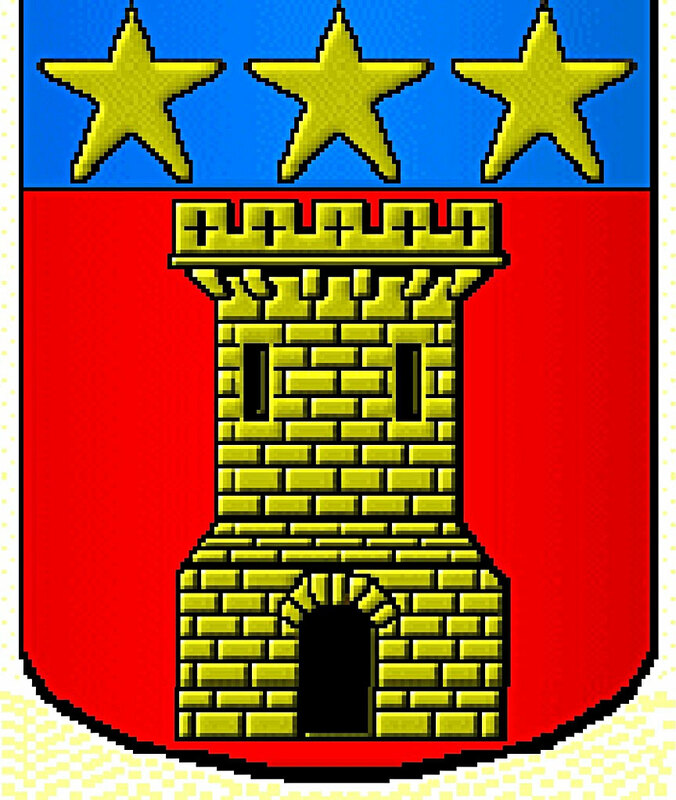 (Alleged Reformed Religion) of Saveilles was an important place of the Reformation in Angoumois. The Touchimbert, then Bourdeille received Saveilles by prerogative, before passing to Disnematin de Salle, then to Ligondès, and finally to Mas Latrie today.